OUR STARS of the Phyl Coe Radio Mysteries were introduced yesterday in Part 1 here at SimanaitisSays. Today in Part 2, let’s see how Philco (“Phyl Coe,” get it?) hyped the programs. Brilliant Marketing. 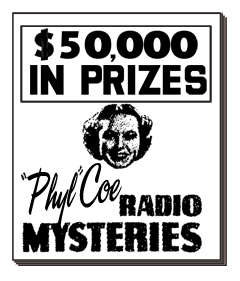 It was 1937 and sponsor Philco offered listeners $50,000 in prizes. Figure something like $865,000 in today’s dollar. This and the following image from the Digital Deli Too. Initially targeted for 100 subscriber stations, by the time the installments aired, a reported 243 stations had signed up. Philco’s original $500,000 budget eventually rose to more than $1 million for the 16-week promotion. To put Great Depression dollars in 2019 perspective, think $8.7 million and $17 million, respectively. 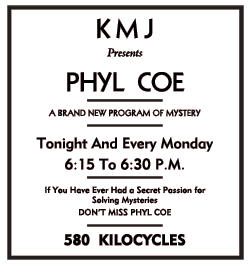 The contest sounds like fun: Visit your Philco dealer each week and pick up the Philco Mystery Book highlighting the four weekly adventures of Phyl Coe’s 16-week series. Each book had two pages of diagrams and clues for each of the week’s four episodes, plus a contest entry blank and list of prizes. Of course, the listener already knew the culprits after listening to the programs. The contest had questions concerning Phyl’s rationale, based on clues and her on-air disclosures. Winners were announced around a couple, three weeks after each broadcast. And, of course, the whole idea was to encourage weekly visits to the Philco store. What About Today? I’d think the Internet provides an obvious 21st-century analog to Phyl Coe’s marketing: The website of a TV who-dun-it’s sponsor would offer weekly quizzes on its character’s deductions. Prizes would be for the most apt (or perhaps quickest, or just randomly chosen) online responses. 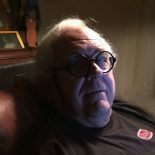 This entry was posted on March 25, 2019 by simanaitissays in The Game is Afoot and tagged "Phyl Coe" Digital Deli Too, Philco "Phyl Coe" book for contest, Philco offers $50000 in 1937 "Phyl Coe" contest, Phyl Coe = Philco radio detective.